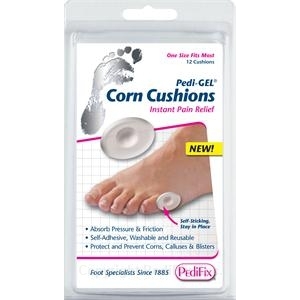 The PediFix Pedi-GEL® Corn Cushions help relieve painful corns. These soft pads feature a 'relief spot' to protect corns from shoe pressure and stop friction. The PediFix Pedi-GEL® Corn Cushions help relieve painful corns. These soft pads feature a 'relief spot' to protect corns from shoe pressure and stop friction. They can be worn directly on skin or inside shoes. Self-adhesive backing keeps them in place. Non-medicated. Safe for sensitive skin.